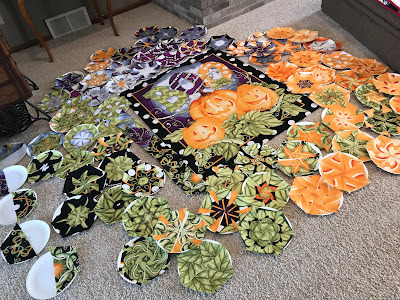 Crawling around on the floor to arrange and pin these hexies may be the end of my wanting to make any more OBW quilts. This has been killing my knees and my back, but I have 2 long vertical rows sewn together and 2 short vertical rows sewn. Several more are pinned. 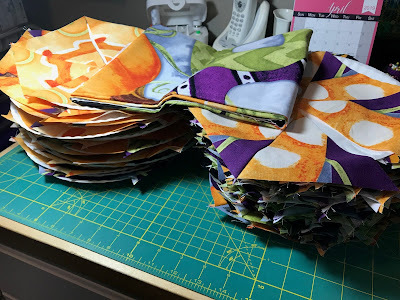 I have to take each pinned row to the basement to sew and press, then bring them back up. So this will definitely be a slow process. I'm glad I have a large floor area in our living room, where I can lay out blocks and they aren't in the way of walking, etc. (We mostly live in our family room.) But with this OBW project I probably need even more space due to the paper plates the hexies are on. I have to say it makes it really easy to move these hexies around and change their locations. I've had this laid on the floor for several days now where I can pass by, observe the way it looks, and move a hexie or two to a better location. You can even see on the left where I have half-hexies remaining on plates. The other halves are pinned together into the vertical row next to the panel. I have one vertical row pinned together and am ready to sew it together later today after work - and a pedicure. 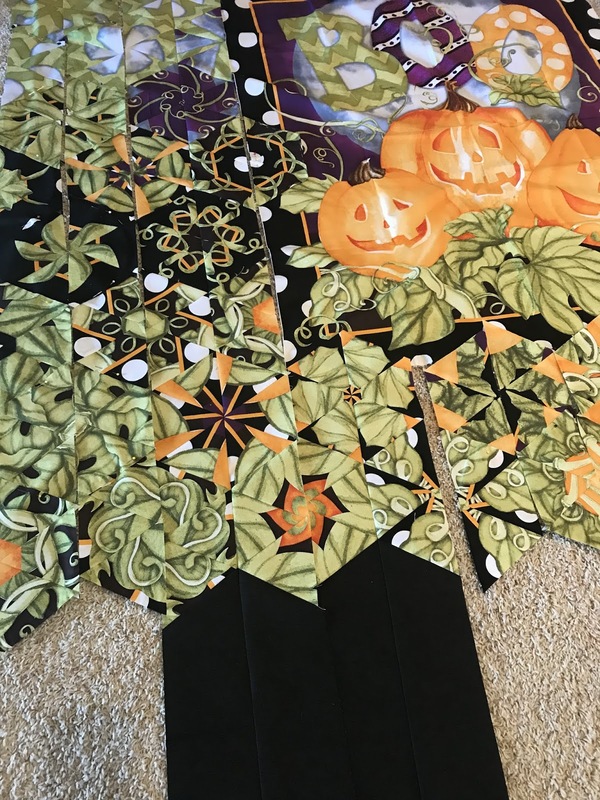 Once I do that and determine that it is the correct length that I want, then I can get more serious about lining up the rest of the hexies exactly where they will end up. I don't want to have straight edges lining up with the panel making a sharp division between hexies and panel. A few hexies will extend over onto the panel, but I'm not sure yet exactly where or how many. So this will be a slow process with other projects happening in between. Enjoying the process, right? Over the weekend, some person (pest, hacker, cyber criminal) posted comments in an unidentified Asian language onto 9 of my blog posts. Five of the comments were on separate posts from March. But 2 of the comments went onto posts from 2012 and 2 more onto posts from 2011. I've had this happen before, sometimes in an Asian language and sometimes in an Arabic language. Very frustrating to be targeted. I found them all (hopefully) and deleted them, then deleted the emails that come from Blogger to notify me of a new comment. Since all of the words were live links I was careful NOT to click on any of those words. But I have to admit that I'm always curious about the real purpose of these. Are they hiding criminal communications? Are they attempting to get me to click on the link and by doing so to install some kind of malware on my computer that could steal my identity or clean out my band account? By hiding these on posts from past years or past months, it suggests immediately that the motive has to be criminal. I'm just thankful that Blogger sends me an email each time someone leaves a comment so that I know where to look to delete them. As if we don't have enough criminals lurking in our own communities, now we have to worry about people on the other side of the world messing with us. GRRRRR! Sunday sewing included some playing. 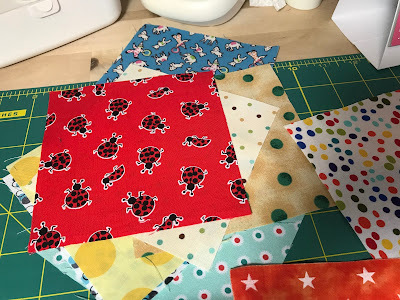 I saw a cute quilt made with Happy Blocks on Mary's blog and just had to make some. 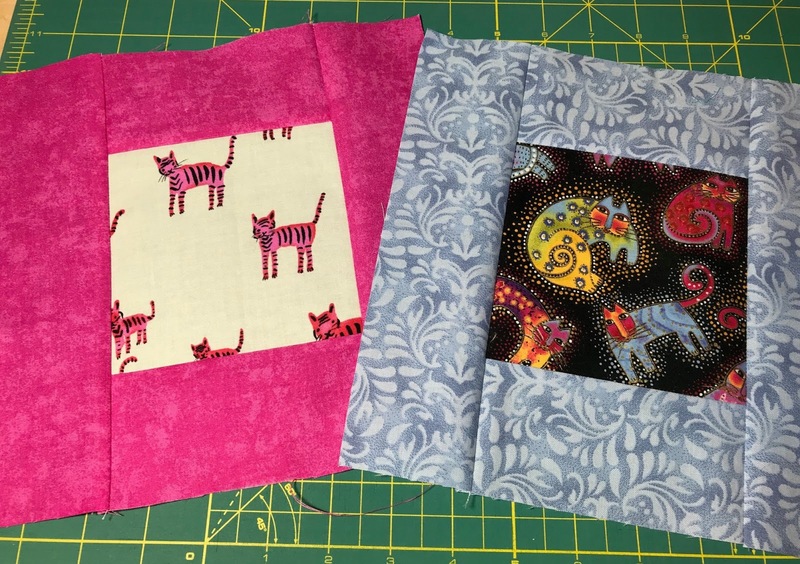 These are made with charm squares and 2.5" strips, both of which I have in abundance. 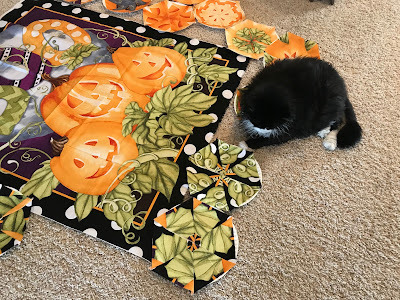 The link to her instructions is https://maryquilts.com/happy-blocks-from-charms/, plus she has a lot of other free patterns. 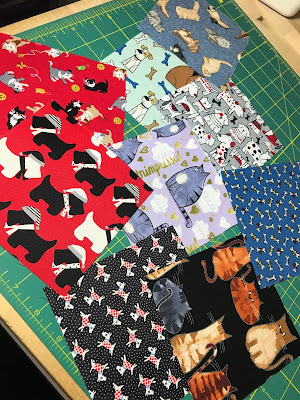 I had a small bag with lots of charm squares that I have collected from online swaps over the years and knew there were some cute dog and cat charms. And there were also lots of polka dots, some bugs, and dinosaurs. 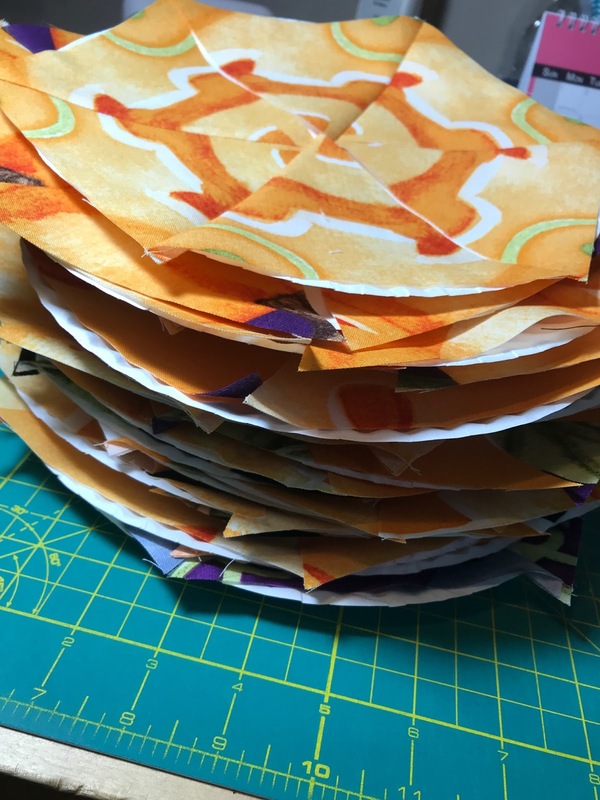 Overall I think there will be enough to make a child sized quilt. I know I don't need any new projects but these were too much fun to not make some. I might have to put the Minnesota loon charm square back in the bag, but the rest of these should work well together. 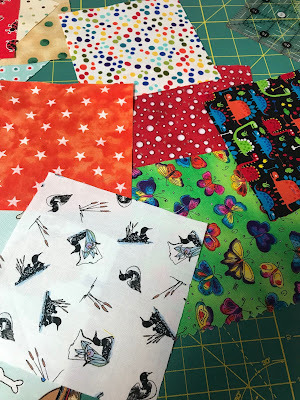 A lot of other quilty fun was had on Sunday. 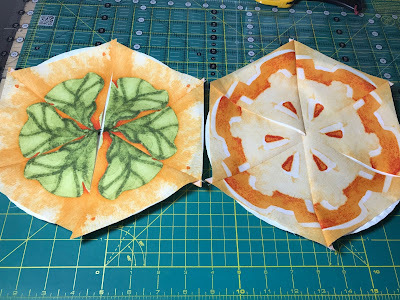 I worked on hand quilting while watching the Masters golf tournament on TV this morning. 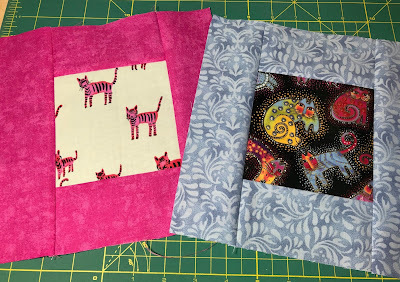 About half of my Saturday Sampler blocks were updated later in the morning, then I played with these Happy Blocks. While pulling the charm squares out I also gathered a couple of future projects and put fabric and patterns together in project bags. And then I rearranged the One Block Wonder blocks on the floor so that I'm a little closer to deciding on a final layout. I know he thinks he's being helpful, but he's laying on top of 2 paper plates with hexies. 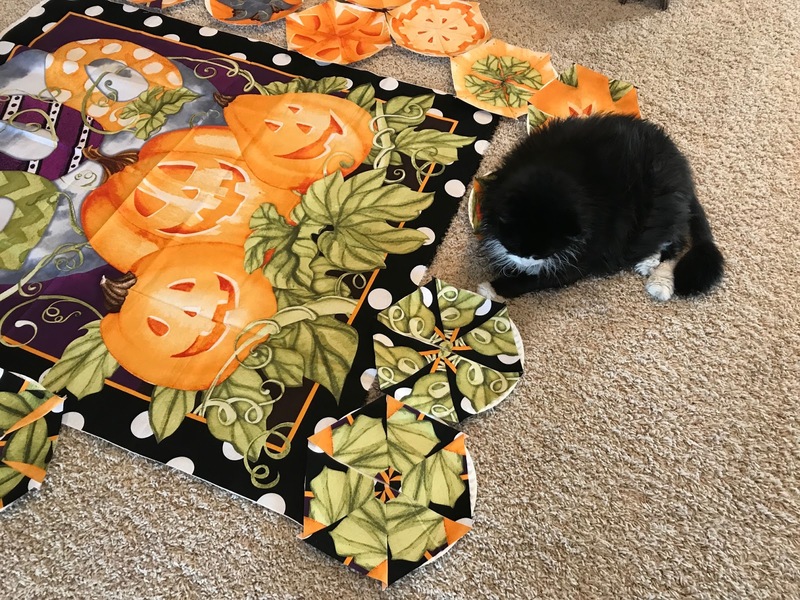 He was sleeping under the piano across the room, but as soon as I began to lay these down he waddled right over and plopped down in the midst of my project. And when a 20 pound cat stretches out for a nap he takes up considerable real estate. 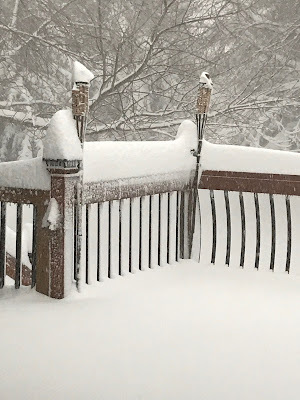 This is our back deck this morning, and it's still snowing. 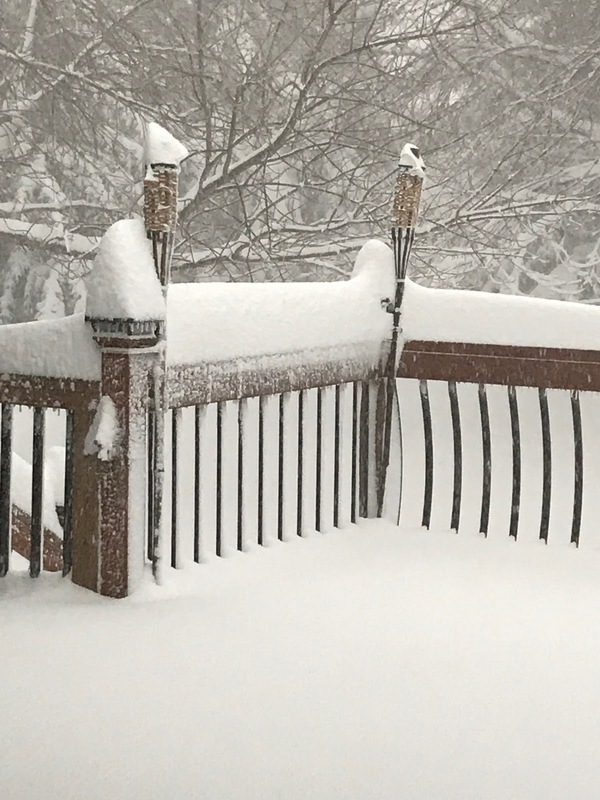 Officially we got 16.5" of snow since Wednesday on top of rain and then ice. Our house is U-shaped and this deck is protected in the U. Plus we have 60 trees in our yard so it really is fairly well protected unless the wind is out of the south. On the north side of the house the snow is hip deep on my 6' husband in places on our driveway. He is out there now (on his 65th birthday) wrestling with the snowblower trying to clear the driveway and then sidewalks. No snowplow has come through our street yet either so we aren't going anywhere today, unless it's much later. Considering the impact a storm like this has on livestock, we have it really easy. I do remember how much work it was to keep our cattle safe when we still farmed. And it's the middle of calving season around here. For comparison - this was yesterday morning - before we got the wind along with additional snow. Yesterday's ice storm turned into a blizzard over night, with lots of wet snow sticking to everything on top of a thick layer of ice. That meant I wasn't going anywhere today, and freed up some time to sew. The temptation to begin a new project was very strong. But I looked at the UFO projects hanging around and decided to work on the Halloween One Block Wonder that was on my UFO list for February - with no progress. 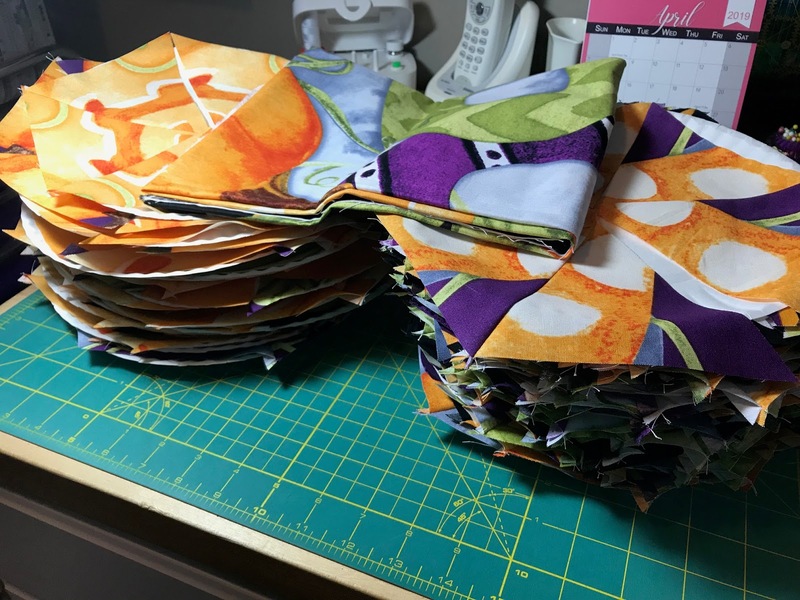 All of the hexie halves for this project are now sewn and ready to lay out with the panel. 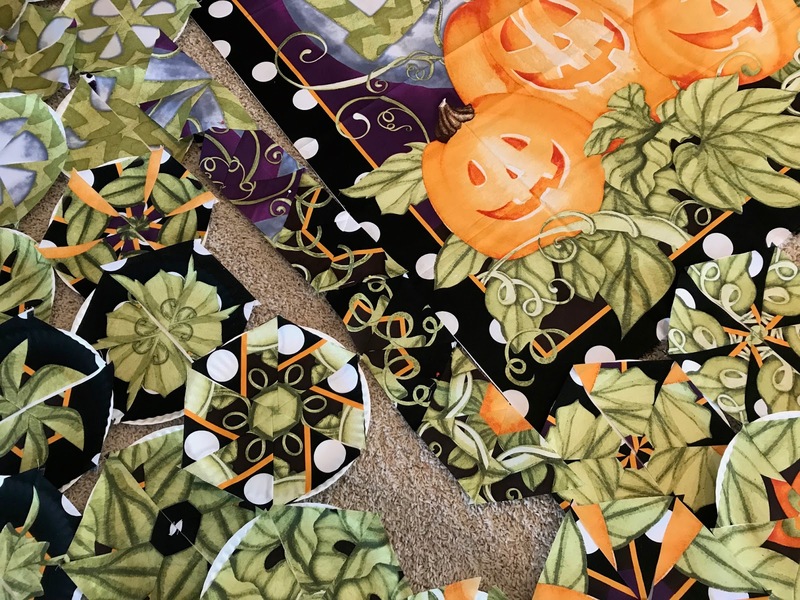 I chose a Halloween fabric panel for this OBW that has a larger scale design, so I cut the strips slightly larger than the pattern book recommends. These were cut 4.5" so the hexies are large. And some of them have very interesting looks to them. A bowl of lettuce and an orange slice come to mind with these two. And some are a bit too monochromatic, but I think they will blend together nicely with the panel. The new blocks are in the stack on the left and the blocks made during the class I took are in the stack on the right. The panel is folded up on top. And this clears off a nice bit of horizontal surface in my sewing room for now. Each pair of hexies is lying on a paper plate so they should be easy to lay out and rearrange on the floor, which is my next step. 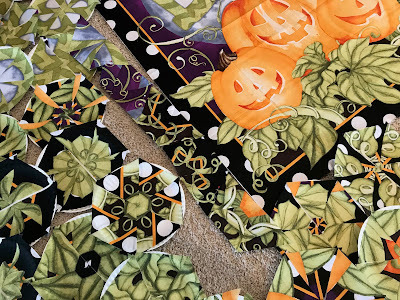 I think this could end up being a very large quilt. As for the weather, it began here Tuesday evening with rain that continued most of the day on Wednesday. By supper time it began to freeze. Those little icicles formed all along the edges of our deck railings. 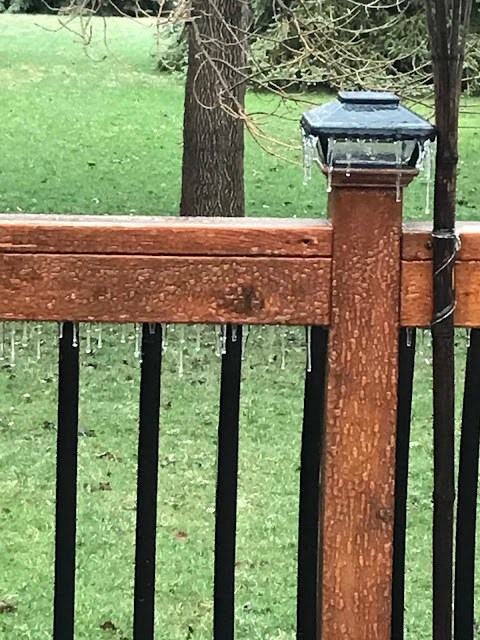 You can even see the layer of ice on top of the railing. It was pretty, but we know this was also happening on tree branches and power lines. Our lights flickered a few times during the day but did stay on. We were luckier than a lot of people in this part of South Dakota who did lose power. And this was what we awoke to see this morning. We now have about 12" of fresh wet snow, which is half of what they predicted we could get before this ends tomorrow. But it's taking its toll on our trees. Our house sits on a lot that is just over an acre and has 60 trees on it. One of the biggest ones is an ash just outside our family room windows. And one huge branch was hanging so low this morning that it was nearly touching the windows. So my husband went out and knocked a lot of snow and ice off that branch. But it hasn't lifted back up by much so we're concerned that the branch will come down with this wind, or need to be cut later. He also plans to go out now and blow the snow from the driveway before the second half of this storm hits us this afternoon.